Tracking an album collection that keeps growing with a pinch of local music and life. Edward Ray Sharpe (born February 8, 1938) is an American R&B and rockabilly singer, guitarist, and songwriter. Born in Fort Worth, Texas, Sharpe grew up influenced by country as well as blues music. He learned guitar, influenced by Chuck Berry records, and in 1956 formed his own trio. His second record, “Linda Lu” / “Monkey’s Uncle”, both sides written by Sharpe, was much more successful. Recorded in May 1959, it reached No. 46 on the Billboard Hot 100 that year. “Linda Lu” has subsequently been covered by many artists, including the Rolling Stones, The Kingsmen, Flying Burrito Brothers, and Tom Jones. Well, this is the last of the Ricky Nelson singles (I believe). The roomie may do a review of one of the singles since I did have so many, but no promises there. I’m not certain that he’s all that familiar with Mr. Nelson. In 1972, Ricky Nelson reached the Top 40 one last time with “Garden Party”, a song he wrote in disgust after a Madison Square Garden audience booed him. After that, he wanted to record an album featuring original material. The single was released before the album because Nelson had not completed the entire Garden Party album yet. Nelson was with MCA at the time, and his comeback was short-lived. Nelson’s band soon resigned, and MCA wanted Nelson to have a producer on his next album. His band moved away but Ricky soon put together a new Stone Canyon Band and began to tour for the Garden Party album. On May 8, 1961 (his 21st birthday), he officially modified his recording name from “Ricky Nelson” to “Rick Nelson”. His childhood nickname proved hard to shake, especially among the generation who had watched him grow up on “Ozzie and Harriet”. Even in the 1980s, when Nelson realized his dream of meeting Carl Perkins, Perkins noted that he and “Ricky” were the last of the “rockabilly breed.”. Two copies of this Ringo single. It’s always nice to have a back up but the one with the actual cover is in better condition. “You’re Sixteen” was first performed by rockabilly singer Johnny Burnette, whose version peaked at number eight on the U.S. Billboard Hot 100 in December 1960 and number 3 in the U.K. in 1961. 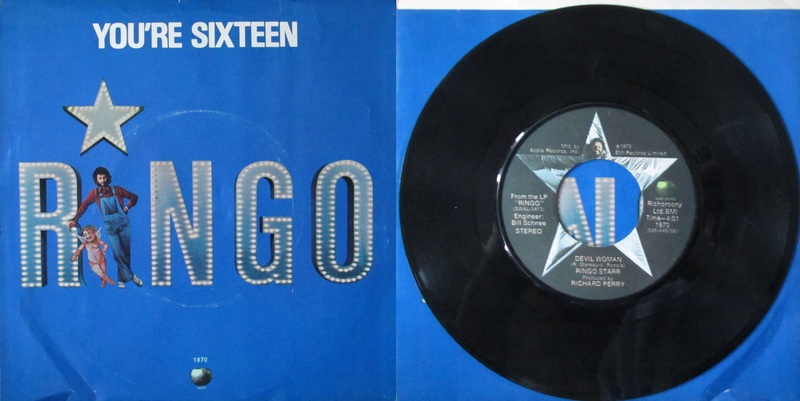 Ringo Starr’s cover version was released as a single in the US in December 1973, and in the UK in February 1974. In January 1974, the song, taken from the album Ringo, hit number one. The B side is Devil Woman. This single is Robin Luke’s top hit. Enjoy! Robin Luke (born 20 March 1942, Los Angeles, California) is an American rockabilly singer. He has been enshrined in the Rockabilly Hall of Fame. The Rock-A-Teens were an American rockabilly group from Richmond, Virginia, active in the late 1950s. They are best known for their 1959 single, “Woo Hoo”, backed with “Untrue”, released on Roulette Records. The song hit No. 16 on the Billboard Hot 100, but it proved to be their only hit. Keep up to date on the latest records cataloged by email. You know you want to! Find Your Favorite Artists, Albums and More! Concerts, Festivals and Shows. Oh My! Dutch ReBelle’s amazing KickStarter, Boston Calling, records galore! What a year!! !